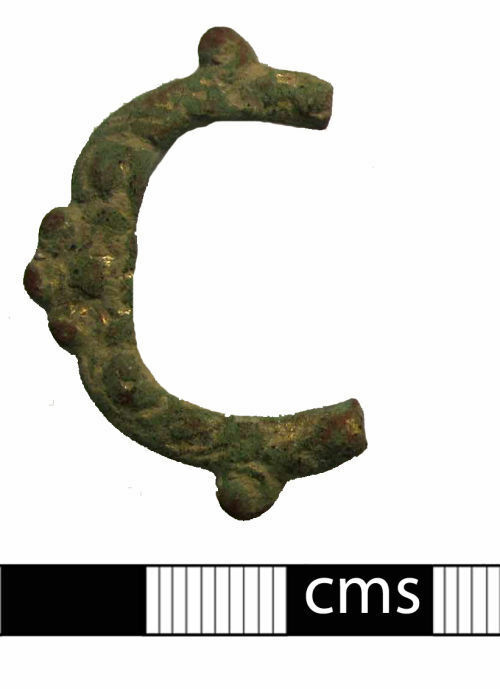 A cast copper alloy double-looped buckle of post-medieval date (AD 1550-1650). The buckle frame is incomplete; one loop and a third of the second is missing due to an old break. The frame of the buckle is decorated with a series of cast pattern comprising rose or rosette like flowers on the frame and scroll or vegetal like tendril scrolls on the body and small knops on the outer edge. The design is also heavily gilded. Similar examples to this buckle can be seen in Whitehead (1996:66), specifically no. 411 which is almost identical to this example; Whitehead dates these to the early post medieval (Tudor and Stuart) period (AD 1550-1650).